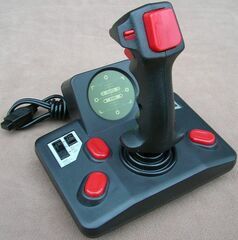 The SG Superboard is a third-party joystick for the Sega Master System (referred as "Sega Video Game System") and the Sega Mega Drive released by QJ. It was released in France, Germany and the United Kingdom only. The SG Superboard is a microswitched joystick with , and buttons and six LEDs showing which button is being pressed. It has a Slow Motion feature, only compatible with Mega Drive, and also a turbo switch.